This is an online game in 14 episodes. The 'read me' file that contains the game manipulations is installed with the game and can be found in the Private Moon - Agon folder in your main drive. 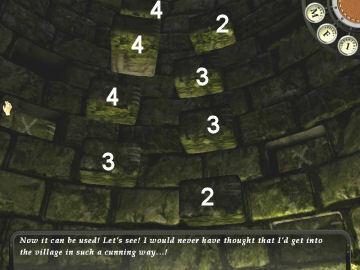 The game manipulations are found in the File (F) that can be accessed during gameplay. Revision: Episodes 1 -3 is now available in CD published by Viva Media. There are 8 saves slots. I recommend that after finishing an episode to make a new folder inside C:\Program Files\Private Moon Studios\AGON\Data\Save\slots folder and copy-paste the old save games into the new folder. You can label that folder with the episode number. Then you can freely overwrite the save games in the gameplay. Watch the Professor enter his office. Click-hold, move cursor down and look close at newspaper on desk. Read the newspaper. Read about the museum and about Dr. Tumblety. Read the 2 page letter from Smythe. His phone number is 55-623. Click on envelope. Read the letter from WK. Note the diagram. Click to look at the codex inserted in the envelope. Both letter and codex will be at F (Files). I who has been given the chance to glance among the pages of truth have prepared to fight the evil, the demonic Black King and to bury all that which tempts all our lives when my mission comes to its end. I have no power left to plant the seeds of the unknown games and to look after their growth and spread, but it is my mission to find all those places where the last masters of the lost board games live, and to mark these places with a strange stone which shows the way. The families of the masters will forever conserve the knowledge and will wait for the day when a stranger fulfils what fate intended for me. He will collect the games and will show what peaceful solutions the world knows instead of weapons and wars, and for man to measure his strength and ability with his fate, to quench his passion. The long shut doors of the masters open before the brave who says: I am in search of the Agon. Have to tell Smythe about this. Check the map on the wall. Go to the bookcase. Books of note: Oceanic Ichthyology from second from top right bookcase shelf, green book of Classes Linguarum from third from top right bookcase shelf and The Fishery Industries of the United States at bottom shelf. The Tea Leaves book at third from top shelf middle case and Graphic Book of Natives from bottom shelf middle case. Hallway: Exit the room. The phone is the director's privilege. Turn left, forward and note the rooms on the right are the offices of Prof. Matthew Brice and Dr. James Bosomworth. The room at the end of the hallway is the Director's office: Dr. Edward Moresby, the director and Dr. Thomas Smythe, director's secretary. There is closed double door beside the director/s office. Go back to the end of the hallway, right from Professor Hunt's office. The room at this end is the office of Prof. Benjamin Johnson. Turn left of the main double doors and see the back staircase door with a key at the lock. Enter and go down the stairs. See your reflection on the second set landing window. Enter the lowest level door. Talk to Swanson, the warehouse guard. He wouldn't let you in the warehouse. Look at the warehouse inventory book on his table. Talk to Swanson again and learn about nodding off when he drinks. Swanson gives you the key with green ribbon to Moresby's office. Climb back up to top floor and go to Director's Office at end of hallway. Director's Office: Use key on door. Smythe's Office - Turn around and click on light switch right of door. Open the cabinet under the window and get a Jim Beam Scotch whiskey bottle. Go behind Smythe's desk and look at an Order Form at in box on left of desk. Not enough information yet to fill out the form. Dr. Moseby's office - Enter Dr. Moseby's Office. Turn around and turn on the light switch left of the door. Check the bookcases. The second from left bookcase middle shelf has Anatomy book and A Map-Geography book. The top shelf has the Butterfly book. The end bookcase lower shelf has the Physiography book about snow and water. The top shelf has the telescope book. Go to the fireplace and see a globe by the desk. Take the box of matches from the fireplace's mantel. Go behind the desk. Zoom in on desk. The calling card has Dr. Moresby's phone# 77-497. Take the rubber stamp from desk. Use the phone to call Smythe at 55-623. Listen and note clues. A black granite arrived from the Pecarian museum. It might be connected to the Black King. Look close at trashcan left of desk. Take the crumpled paper and note at bottom of page - October 1, Black Granite Sculpture (sitting figure) 1020624. Take the key back to Swanson and the door is left open 'accidentally'. Give Swanson the key with green ribbon. The Professor also gives the whiskey to Swanson. Look at inventory book again. Note that on October 1 (date the Black granite was catalogued), the larger items are in Store D.
Go back to Director's Office now that you have all the data needed. Go behind Smythe's desk and fill out the Order Form. Type in inventory number 1020624 in Store D. Click enter. I just need to certify this now. Then take rubber stamp from inventory and click it above logus sigilli. Go back down to check if Swanson is asleep. Once he's asleep, go forward to the key cabinet, watch and then open the key cabinet. Key Puzzle: The object of the puzzle is to place all the keys back on the nail hooks. Check the inventory book again and look at the very end of the notebook. Packard Company's phone # 26-444. Peter's home phone # 56-961. Store A lock needs to be changed. Mrs. E. von D's legacy placed in special cabinets with keys attached. Dr. Moseby's new safety key is the one with green ribbon. New upper safety lock in Store C since January. Object over 25 lbs are in Stored B and D.
Go back to inventories page and note that Mrs. E. von D's legacy (with keys attached) is in Store B. Main Building - key with MB. Dr. Moseby - key with green ribbon (noted at back of inventory book). Store C - key with one additional key (noted at back of inventory book - new upper safety lock). Store B - key with 2 smaller keys (noted at back of inventory book - with keys attached). Store A - newest key (noted at back of inventory book - needed to be replaced). Store D - single rusty key. Look around and see storage A is to left of Swanson. Go forward to hallway where Store B is the first door on left. Go forward once after storage B and take lantern from left on top of crates. Storage C is at end of hallway accessible by grilled door. Storage D is on the right of hallway with lopsided sign. Go to end of hallway, turn right and use the rusty key. Enter. Click on match in inventory and click it on lantern. There are 4 aisles planked by storage shelves. Pan cursor to the left, click to aisle (second), pan left to go forward to corner of room. Then pan right to the first aisle closest to wall of room. Go forward to end of the aisle, turn right and forward. Watch. Look close at the geometric pattern on the Black King's arms. Click on stone at bottom left. Take the stone that is part of 13 geometric shapes. See runes. Now to study the runes. Go back to your - Professor's Office. Take the green book of Classes Linguarum from third from top shelf of right bookcase. Flip the pages to the Hungarian Runes. Note: Hungarian runes were usually written on sticks in boustrophedon style (alternating direction left to right then right to left). 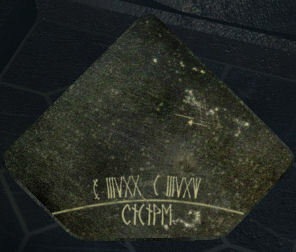 Click on and decipher the Stone. Based on the alternating direction left to right then right to left and the addition of the numbers, it is deciphered to be: E 28, N 68, v a i n i o. Type it in and then click 'Enter'. Go to map by desk. Click on map. Move magnifying lens to N 60-70 and E 20-30. Click to look closer. Move N 65-70 and E 25-30. Click again. Move the lens to E 28 and N 68. It is at Lapland and the family that holds the next clue might be a family named Vainio. Use the phone to call Smythe at 55-623. Watch as Professor Hunt describes his night's adventures. He will travel to 12 corners of the world. Only his wife and Smythe will know where he will be. Watch as the Professor takes the early train from London to start his travels. Read the mails that describes the Professor's travels from London to St. Petersburg, Russia. Learn about the John Gillam Codex and his experiences in Russia. Start of the game shows a letter written by Professor Samuel Hunt to his wife Dorothy. He is on his way to find a certain person named Vainio in Lapland. Professor Hunt gets off from the train. Nobody is around. Ring the bell left of the station. Go around the back and see a locked door with a hole on the left. Look close at signpost Borgesiida on the right and Guovvasiida on the left. On the other side of the depot is a water tower. Go back to front of the depot, knock on door and then try the doorknob. Enter to smell of alcohol. Try to wake up the stationmaster. Look around the room. Check the desk and see the sealed letter for Station 76 from T. Pekka, chief of central station. Read the stationmaster's letter to his son. So sad. Remember, the mention of Kaira and how she obeys certain whistles. Kaira waits patiently after 3 identical whistles. She will start the baggage if one sound is higher than the other 2. She will go north if the whistle has wider difference between the middle sound and the other two. Look at the chart on the right and it mentions Kaira and c-f-c-f-c-d-c. Check the stove - it's cold here. Take a stump (wood) from beside boiler-stove. Open the stove cover. Place the newspaper that is in inventory and the stump in stove. Go to bookcase by mirror and lamp. Move the brown book at right end and get matchbox. Open stove and click matchbox on opened stove. Go out and go to the water tank. Climb water tank to the top. Take a step forward and look down. Turn the lever to bring water to the boiler-stove. Go back inside it's cold out here. Look at stove and turn the lever at top right pipe. Now we have heat! Turn around and look at the map. Where we suppose to go? Episode one states we go to 66 N and 28 E - hmm that is at Borgesiida up north. But how do we get there? 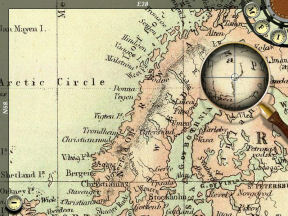 Look at the telegraph machine under the map. There's still a message on it. Look at the long strip of the tape. Decode it using the Morse Code book found on the shelf above the drunken stationmaster. Each word has a bigger space in between the dots and dashes. Type in the word, press next to get a space and then type in the next word. When all the words are typed in, press enter. Hmm we have to find that sleigh and ride to go north. No help from the stationmaster. Look close at the stationmaster that turned over when you came back into the room. Take the small key. Go to the cabinet under the window and use the key on the lock. Take the medicine and read the letter from the stationmaster's son, Paavo. Included in the letter is a chart. Study the chart and note the drawing of the room. This is the mechanism of the shed lock. The door is at back and gear mechanisms on bottom wall and right wall. The bottom wall gear is depicted on the left - it is down to the second notch. The gear on the right wall is down 5 notches. Go to plates on wall in front of the door. Look down on the step stool and move it to the left. Look up and click on left plate. To adjust the gear placement, move it left to the very end. We need it to be in the second notch - so move it right one notch. Go out of the building to look for the gear mechanism on right wall. Go to wall opposite the water tower. Look at the wheel on the wall. Adjust the gear to very end by clicking to the left until it stops. Then we need it to be on the 5th notch - so move it to the right 4 times. Go to the locked door of the shed behind the house. Look at the hole and see it has a triangular keyhole now. Now, we only need the key. Where? Go to the bell hanging at corner of the depot. Looking up from below the bell, take the key hidden in the clapper of the bell. Back at the lock of the shed door, use the key on the hole. Open the door and enter. Shed: It's a very nice workshop. At the other end is a steam organ. Oh, this must be the way to call Kaira. We need steam to use the steam organ. Go to the end of the pipe on the wall and turn the tap to get steam. Oops, the steam is escaping and the pressure is falling. Turn to the left and see where it is leaking. Turn the tap off. Look down at the makeshift bench under the pipe and get lint (bandages). Turn the tap on, turn left and use the lint on the leak. Go to the steam organ and press c-f-c-f-c-d-c, the notes taken from the chart by the table inside the depot. Go back inside the shed and based on the letter mentioning Kaira let us try and enter d f d on the steam organ. Go out and see Kaira going to Cuonesiida - that's not where we want to go. Go back inside and try e f e on the steam organ. Go out and see Kaira going to Guovvasiida - that's not where we want to go. Go back inside and try c f c. Go out and see Kaira going to Borgesiida - now we're rolling. Climb on the sled and go north. The village looks deserted. Look around and knock on doors. At the left road, go to the second house on the left, go around the right side of the house and look at the numbers etched on the wall above the firewood - 2 6 4 3 5 1. Go across the road and knock on the house on the right with a black circle on the door. Prof. Hunt enters after no response. Talk to the barkeep but no answer is given. Talk to the young woman sewing but also no response. Go around the table and see a stove. Take the cup on the shelf right of the stove. Notice that the dog is sick. Go outside through the door and turn around. Take the icicle hanging on the left by the door. Go back inside the bar and go to the stove. Combine the icicle and cup. Place the icicle on cup on stove. Add medicine to water in cup to get to get dissolved medicine. Go to the dog and place the dissolved medicine on his bowl. Watch Professor Hunt make the dog drink the medicine. The young girl goes out and on the way out beckons at the professor. Go out and talk to the young woman. She knows Vainio, a reindeer herder. He is her sweetheart. Her father, barkeep and first man of the village doesn't want her to associate with a Vainio, a family that is supposed to keep a secret for centuries. Virpi is nearby right now at his hut by the lake. You can get to him using the sleigh and trusty animal by going to the border, go north beyond the river. She wants you to deliver a letter for Virpi. Enter the pen. Pick up the oilcan by the sled. Sit on the sled - at least it's not a box this time. The bridge broke right before the professor is to cross. There's nothing left to do, I have to walk the rest of the way. The path splits right and left with the clump of trees in between. Take the path right of the trees. 3 Clicks forward and facing 2 trees, turn left and one click to the big boulder. Turn left to the boulder and take the wheel hidden between the rocks. Go forward one click, face another clump of trees and there will be a way to the left and to the right. Take the path left of the trees. Go forward 2 times and turn right to go to the polar light observation post above a small rise. Polar light post: Place the wheel on the tube holding the machine on the left stand. Oil the tube. Enter the number seen on the wall of the house across the bar at the village - 2 6 4 3 5 1. A drawer opens. Read a page of the codex. Check the file to read it closely. Pull out of close view, pan right and go forward until the broken bridge again. Turn around and go right again. Go forward, pass the boulder where the wheel was found and turn right to a boat on the dock. Turn right and follow the frozen river (5 clicks) until Vainio's hut. Hut: Vainio would not talk to you. Give him the girl's letter. Talk to him again. He thought the Agon is just a legend. He needs to prepare you for the fight with the Tablut. He will play Tablut until you win. Tablut: Read the rules. The white King that is at the center of the board must reach a shaded corner. For the King's white counters to capture the black opponent, 2 white counters must surround a black enemy vertically or horizontally or between a white counter and a shaded corner. The King is defeated if he is surrounded on all sides by black counters or if the King is beside the throne (central shaded square); he can be surrounded on 3 sides by a black counter. Play the game: The King is solid blue, his counters are blue and white and the enemies are red and white. The strategy I used is to try to empty a space at one enemy wall and the projected corner square the king will go to. The king's counters are moved to block the space around the area that is being cleared and to remove the enemies. The King is moved one step off the throne or central square parallel to the target wall before going to that wall. The path that is cleared should get the King to move to the wall in one or 2 moves and to the corner square in another move. Have fun! You can also go to Main Menu and set the game difficulty on easy mode. Click apply and play. It will be easier to solve the Tablut game. This solution might take a long way around but it works on the 'easy' mode. Once you win, Virpi Vainio is happy because now the curse is lifted from the family. He gives you a stone. Watch Professor Hunt ride the train for his trip to Madagascar. Read the letters sent by Smythe. He mentions about getting funding for Prof. Hunt's expedition, Dr. Moresby's signature in the application and his investigation about the Codex. Prof. Hunt writes about his meeting with Cyrus Adamson. 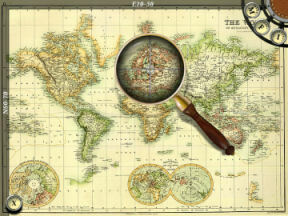 Read the travels of Professor Samuel Hunt from the British Museum, London to Lapland in search of the cursed families that are the Masters of that country's board game. Now, Professor Hunt is on his way to Madagascar, the destination shown by the granite plate kept by the cursed family in Lapland. Listen to Professor Hunt's read his letter to his wife. He is in search of the family Rakotonarivelo, the keeper of the secret here in Madagascar. Beach: Look around at the beach and note the gray boulders at one end and the hanging fishing nets on the other. Go forward to the path going inland by the fishing nets. Village: Talk to the guard using all available dialogues. The guard thinks Professor Hunt is a pirate and learns that Rakotonarivelo is the chief of the village. Learn about the lemur, berries, forest and the old man. Pan left and take red berries from the platter by the wall. Take the path on the left and see a lemur. Look close at the lemur and place the red berries on the rock. To get to the clearing in the forest: Go forward and hear the lemur's cry. There are 4 exits in the forest at every quarter turn. The lemur does not cry at the back. Move the cursor until the lemur's cry coming from your computer's speakers or headphones are at the center-balanced and heard loudest. Wait for the cry before looking for the next direction. Click forward to that loudest cry direction. On the next screen, do the same - keep on finding the direction that the lemur's cry is the loudest and heard balanced on the speakers. It took me 8 -10 clicks. This depends on selecting the loudest cry and if you have to backtrack. When close to the destination, the cries stop. Clearing in the Forest: Go forward to the clearing and look around. Turn left and go close to the steps going up the tree house. There are some steps missing. Steps for the tree house - Go forward 2xs to the other side pass the tree house. Take slats from the pile under the red saw. Look close and note a nutcracker. Turn around, go forward until the fire pit on the other side of the tree and take the rags from the log beside the fire pit. Go back to the steps of the tree. In inventory, combine the rags and the slats to make 2 temporary steps. Click the temporary step on the hole on the tree trunk. Go up and use the other step on the next hole. Notice that another hole is missing a step. You can also turn around going down when up the steps, take a temporary step previously inserted and use it on a hole higher up. Tree House: Enter the tree house. Go to the center work table and take the match and Enina paper. Go to the window by the stairs going up. Take the step (wood). Take Iray paper from floor and the Efatra paper from the basket. They will be placed in the journal. Turn around and look at the painting. Note that the name of the vessel is ABE. Go up to the next level. Find a very sick old man. Click the wine on the old man. I'm hungry. Feed the old man - Turn around and look close at the shelves. Take the bowl, lantern and brown berries from the shelves. Go back to the first level of the tree house. Go to the curtained exit and turn right. Use the bowl on the rice in a basket to get bowl with rice. Go down, use the step on the hole and forward to the fire pit outside. Place rice on the hanging pot at the fire pit. Go forward once towards the leafless trees and then turn right. Use bowl on barrel of water to get bowl full of water. Click the bowl full of water on the rice pot. This is not enough. Get another bowl full of water. Go forward to the leafless trees in the background. Take firewood from the ground below the leafless trees. Go back to the fire pit and add the second bowl full of water on the rice pot. Place the firewood on the fire pit. Click match on the firewood. Go out of the cooking area, come back and the rice will be cooked. Use bowl on cooked rice to get steamed rice. Captain's dwelling: Climb the ladder to the Captain's dwelling. Turn left and take all 4 (Valo, Folo, Fito, Sivy) poems from the window frame. Pick up the Telo poem from the floor. Look at the scattered books by the hammock: Musical Instruments, Marine Dictionary (Where?, What?, When? ), Deck & Port, Voyages and Travels and the books by the entrance: Plant book and the English Malgasy Dictionary. Read the Malgasy Dictionary and note the translations of the numerals - sounds familiar, eh. Go down to where Jonathan is. Take the Dimy paper right of the water jug by the window. Take the Roa paper behind the mushroom bag on the shelf by the entrance. Time to look for the Captain's grave. Nutcracker - Go out of the hut and go to the nutcracker, 2 clicks on the other side of the tree house. Place the brown berries on the mouth of the nutcracker and press the lever on its back. Take the red berries. If you need more red berries, just get brown berries from Jonathan's room and use them on the nutcracker. Go to path right of the fire pit and give the red berries to the lemur. Enter the forest on the right. Here we go again. Grave in the forest: To get to the grave, this time follow the direction of the faintest cry coming out of the left computer's speaker (right speaker works also) lemur cry. Wait to hear the next cry when turning around a location. Usually 3 clicks and then no lemur cry can be heard. When close to the destination, the cries stop. Another explanation is that you can get to the grave if the lemur's cry (loudest) is ignore. The lemur only knows the way from village to clearing. Go forward 2xs and then see the Captain's grave. The cemetery has the Captain's grave on the right, 9 grave posts on left and above the grave and a headstone. Each grave posts has different shapes and color placements. Under the wood shapes are glyphs marked on the post. 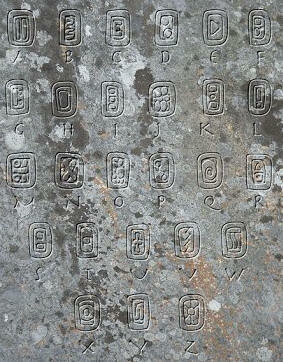 Look close at the back of the headstone and see glyphs that match the glyphs on the grave posts. Grave posts puzzle - Note that the posts' markings are similar to the Captain's poems-drawings. The object of the puzzle is to arrange the grave posts in order. Click on a post and it will change the cursor to that post. Click the post cursor on another post to replace that clicked post with the one on the cursor. The cursor will now have the removed post as the cursor. 1. Match the title of the poem to its counterpart grave post. Take note of the colors and shapes of each segment under the bull. The position of the posts changed in my replay. 2. Based on the Malgasy Dictionary at the Captain's room, arrange the post from left to right: 1-9. The Folo poem is an additional clue. Additional clues for the positioning of the posts are found on the poems themselves. When correctly done, the Professor will say - let's see what else have changed. 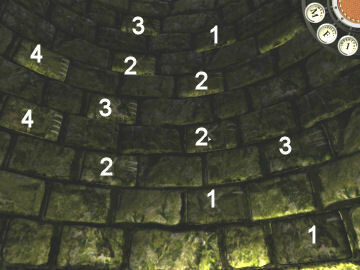 Headstone glyph puzzle - After arranging the posts correctly, the glyphs are now active. The object of the puzzle is to decipher the message glyphs on the grave posts by matching the posts' glyphs with the headstone glyphs. Click on the headstone with glyphs and see a text input frame. Type the decoded letters on the text input frame. Use the 'next' button for space, use the left pointing arrow to erase an error and then press 'enter' when done entering the letters. If done correctly, Professor Hunt will read the phrase. Go to the right side of the grave by going to the entrance of the cemetery and then turn around. Look close at the etched name Jeremiah Dodd and years. Use knife on the years 1821-1875. Take the third page of the Codex. Read Captain notebook. Both documents are in the File. Take note of the last page of the notebook that shows a chart and the telescope's different adjustments. Click on the opened compartment to place the dates back. Time to work that telescope. Go back to the clearing by going outside the gravesite and go to the direction when the left speaker's faintest lemur cry is heard, wait for next cry and continue as before. When close to the destination, the cries stop. Then go forward 2xs. You can also follow the lemur's cry and end up in the village with no action to be done. Tree house: Look at the painting on the lower level and Hunt should say 'Abe'. Go up and talk to Jonathan again about the name of the ship. Captain's room: Go up to the Captain's room. Telescope puzzle: If you have not done so yet - Look close at the telescope and then look through the lens. Change the adjustments of the handle on the left, the horizontal lever at the center and the vertical lever on the right. Look through the lens after a change in the angle and direction is done. Note down certain phrases seen written on different locations and the positions of the adjusted handle and sliding levers. 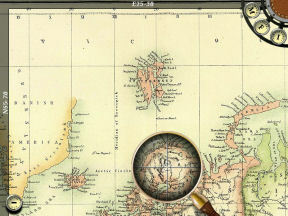 Using the chart of the telescope's angle and directions in the last page of the Captain's notebook derive the letters that corresponds to the phrases seen on the telescope. Mariner's Dictionary: Click on the dark book on the floor beside the telescope. See a text input frame, right of the Where?, What?, When? Type the decoded phrase on the text input frame. Use the 'next' button for space, use the left pointing arrow to erase an error and then press 'enter' when done entering the letters. Enter the correct phrase as seen through the telescope as answers to the Where?, What?, When? Based on the clue left by the Captain on the ship's painting. Type in the phrases that corresponds to A B E.
A = Where? Type on the beach. Press enter. B = What? Type the skull rock. Press enter. E = When? Type at ebb of tide. Press enter. If done correctly, Professor Hunt will read the completed sentence. Go down and go to the forest path. There is no need for the lemur guide. Automatically Professor Hunt is transported to the beach. Beach: What a glorious view! Go to the fishing net and the Professor will recognize Skull Rock on the other side of the beach. Look down and take 2 seaweeds (water plants). Skull rock: Go forward to skull rock. Take the water edge path and go around to the other side. At the other side of skull rock, note the bamboos scattered on the sand hill. Go forward and see a cave. Cave: Enter the cave and go forward to the end. Look up and see an opening above the rock wall. Look down and take the 2 timbers from the water. It will be placed on the rock. Go outside and pick up all 8 bamboos from the sand hill. Go back to the timber inside the cave. Place all 8 bamboos on the timber. Click the 2 seaweeds on the improvised raft. Click on the raft and see the Professor rise up to the opening on top of the rock wall. Cave tunnel: Light the lantern with the match. There's another lantern here at the mouth of the cave. Go forward until you reach the chest on the left. Go forward past the chest to the dead end. Look close at the rocks at the end and see a 'useful tool'. Go back to the chest. Click using the gear cursor on the chest and see that it is heavy. Click using the magnifying cursor to look inside the chest. Take all the rocks out and then pick up the package - game board. Now, click on the chest to move it aside. Enter the other tunnel. Go forward until the well. Well: Take the ladder and prop it on the wall of the well. Climb up and click on the well wall. The bricks can be moved. Hand is not enough for the operation. Look close on the wall and see marked bricks. The bottom right brick can be acted on. Pull back from close up and look down. Take the pick axe shaft. Aha, guess where the head of the pick axe is - the 'useful tool' at the rock slide dead end close to the chest. Go back down, walk the tunnel and climb up the opening at the end to the chest. Turn left, go forward to the rock slide of the dead end and look close at the rocks. Use the pick axe shaft on pick axe head. Combine the pick axe shaft to the pick axe head to make - guess what - a pick axe. Go back to the chest, enter the tunnel and go to the well. Climb up the ladder and make brick steps to get to the top. Bricked well wall puzzle - The object of the puzzle is to make 2 columns of brick steps to get to the top. The bricks are marked as to their different size as seen by the lines at left side of brick (1 -4). Take a brick out, place it in an appropriate or larger sized hole. Place a brick one size bigger as replacement to make a brick that protrudes out that can be used as a step. If the original brick in place has one line, place a brick with 2 lines. If the brick has 2 lines, take that brick out place it in a hole and place a 3 lined brick as replacement, etc... One hole has a brick that took the last bigger size brick. This is either one of the top 2 bricks. To start, use the pickaxe on the bottom right brick with 1 line. That removes a brick and leaves a hole. Continue taking a brick and placing them in a hole made, until 2 columns of protruding bricks make steps on the wall. Note that each brick has line(s) on right side. That is the size of that brick. The numbers are the lines at right side of the bricks that replaced the original bricks. Watch the Professor climb up the well and get clobbered by the guard. Ouch! Chief's hut: Wake up to see the chief's daughter, the guard and the chief himself inside the hut. Talk to the chief completely. Show the chief the game board. Talk to him again completely. Save game here for board game rules reference. Fanorona board game: Read the rules. The object of the puzzle is to take all the pieces of the opponent. You can also go to Main Menu and choose easy gameplay for this last puzzle. Solution in Normal Mode by Jenny100's brother! Thank you! 1. Move D3 to E3, remove C3. 2. Move C2 to C1 to E3 to D3 to D2 to B4 to D4, remove E4. Move to C3 to B3 to B4 to F4, remove G4. Move to F3. 3. Move H1 to H2 to I1. 4. Move B1 to C1. 5. Move B2 to C3. 6. Move F1 to F2. 7. Move C1 to E3. 8. Move E3 to F4. Done! When you win one game, the chief gives you a stone he has kept in his heart since his father's death. The chief is happy that the curse is removed from his family. Listen to Professor Hunt's letter to his wife Dorothy. Look at the drawing given to him my the last pirate of Madagascar. To be continued in the next episode........ Lost Sword of Toledo.